Using the properties of magic covered in Part 1 of this series, all the different magics of the Known World are grouped into categories. The inception and study properties of any magic will determine its autonomy. 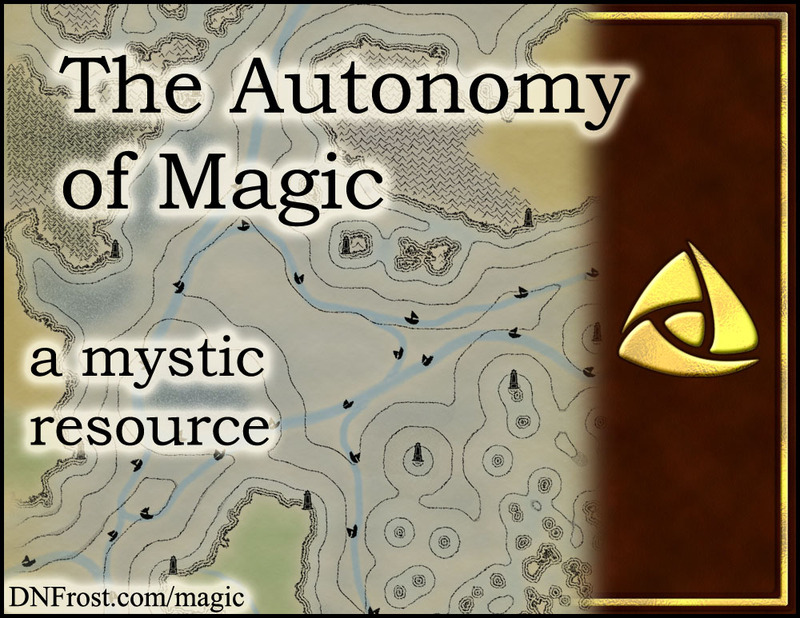 There are four types of autonomy: Basic, Advanced, Skillset, and Deep Magic. Basic magic arises independently of any other skills, and is developed independently of any other skills. Only the magic itself matters as an individual progresses towards mastery. For instance, a faerie learning air magic can create winds or updrafts without any need for external skills. In the spell lists, basic magics are denoted by a [B]. Advanced magic arises independently of other skills, but its development depends on the development of related skills. High-level magics often arise in young magic users, but these magics are weak and cannot be improved upon until the basic magics that support them are developed. For instance, a faerie must learn to move the air - a basic magic - before she can make clouds or evaporate puddles reliably. In the spell lists, advanced magics are denoted by an [A], followed by the related skill or skills. Skillset magic arises within the practice of a related skill, and its development depends on the improvement of that related skill. Healing is a skillset magic because it relies on knowledge of the body's health and natural healing processes. For instance, a faerie cannot heal using air magic unless she first learns how the body's breath promotes wellness. In the spell lists, skillset magics are denoted by an [S], followed by the related skill or skills. Deep magic arises within the knowledge of a special language called Ryunic. Though it develops independently of any other skills, deep magic is very rare in my Tales of the Known World saga because the Ryunic language is not shared or taught. Instead, certain individuals are born with this language dormant inside them. These rare few are called rosen, and even they don't remember Ryunic until they hear it spoken by someone else. Usually, a more experienced rosen will trigger the memory for an apprentice, then guide him through the rigors of development. Because of the special language required, there are no documented spell lists for deep magic.